Turmeric (Curcuma longa) is a pumpkin-coloured spice found in curry powder. It is mostly cultivated in India, China and Indonesia. In traditional Chinese medicine, it is widely use to treat conditions like menstrual difficulties, colic, jaundice, toothache etc. Curcumin, which is the primary constituent in turmeric, has an anti-inflammatory properties. It inhibits the production of leukotrienes and thromboxanes. Bromelain (Ananas comosus), a proteolytic (protein digesting) enzyme found in pineapple, helps to block the production of kinins, reduce swelling and bruises, promote speedy recovery and healing of the soft tissue injuries. It is best to combine turmeric and bromelain together to produce a synergistic effect. Turmeric gets absorbed better when it is taken with a proteolytic enzyme. What Makes Natural Factors Turmeric & Bromelain unique? What Are the Health Benefits Associated with Turmeric? The primary components in turmeric that display anti-inflammatory properties are curcumin and its similar compounds. In our cells, curcumin reduces inflammation by inhibiting the release of inflammatory mediators such as leukotrienes and thromboxanes. Specifically, it is shown to play a role in inhibiting the activity of the 5-lipoxygenase and cyclooxygenase enzymes, and blocking the synthesis of pro-inflammatory eicosanoid. Besides, curcumin also breakdown cortisone, the body’s anti-inflammatory hormone. In a double blind clinical study, curcumin and anti-inflammatory prescription drugs, such as phenylbutazone and other non-steroidal anti-inflammatory drugs (NSAIDS) were given to patients with rheumatoid arthritis. Both patients had noticeable improvements in their joint swelling and morning stiffness. Therefore, curcumin is generally used as an alternative to prescriptions for the relief of symptoms associated with inflammations. What Are the Health Benefits Associated with Bromelain? Bromelain is a natural occurring enzyme found in pineapple. It helps to relieve pain associated with sore joints, bruises and other soft tissue injuries. 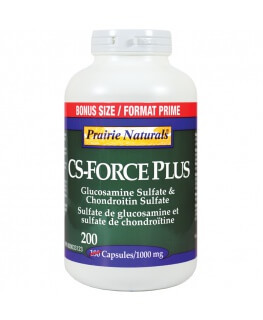 It works by inhibiting cyclooxygenase enzyme which then reduce inflammation. On the other hand, it also plays a role in the breakdown of fibrin (fibrinolytic) and thereby minimizing local swelling. Clinical studies show that administration of bromelain prior to surgery appeared to reduce the pain duration and increase recovery time. 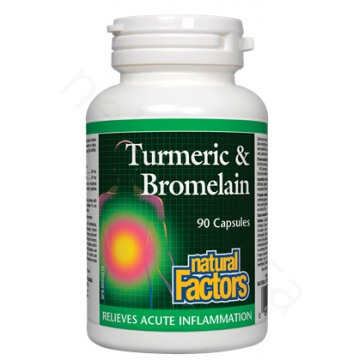 Why does Natural Factors put Turmeric and Bromelain together? On average, Turmeric has an absorption rate of 60%. Research discovered that by combining it to a proteolytic enzyme such as Bromelain, the absorption rate goes up. 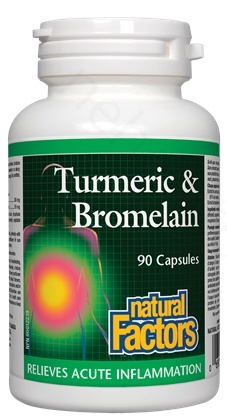 Therefore, Natural Factors Turmeric and Bromelain provide you the convenience of taking both in one capsule. Adult Dose: 4 capsules daily preferably with meals or as directed by a healthcare practitioner. Recommended Use: Helps to relieve acute inflammation. Do not use before surgery, or if you have a bleeding disorder or a history of stroke. Do not use if you are allergic to pineapple. Consult a healthcare practitioner prior to use if you are taking antibiotics or have allergies to plants. Discontinue use if a hypersensitivity reaction occurs. Consult a healthcare practitioner if you experience gastrointestinal disturbances or if you have a history of gallstones, biliary tract obstructions and/or stomach ulcers. Consult a healthcare practitioner if you are taking blood thinners. Do not use if you are pregnant or breastfeeding. Keep out of reach of children. Meschino, J. "Natural anti-inflammatory supplements: research status and clinical applications." Dynamic Chiropractic (2001). Conrozier, T., et al. "A Complex of Three Natural Anti-inflammatory Agents Provides Relief of Osteoarthritis Pain." Alternative therapies in health and medicine 20 (2014): 32-37. ANTI, PHYSIOLOGICAL ACTION OF NATURAL. "THE CLINICAL USE OF NATURAL ANTI-INFLAMMATORY HERBS AND SUPPLEMENTS JAMES MESCHINO DC, MS, ND." concern 15: 16.